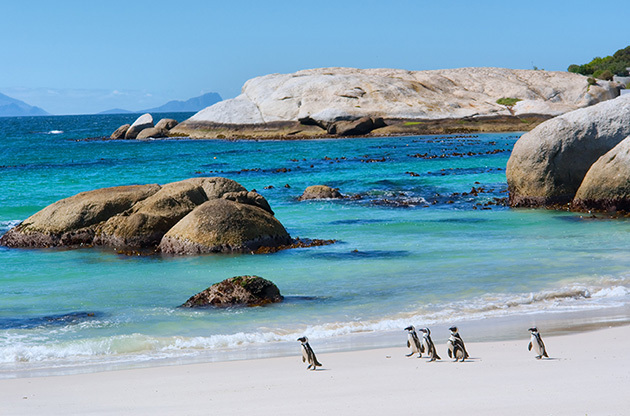 Cape Town, one of the 3 capitals of South Africa is actually one of the cities in the world that attracts a lot of travelers who are after an exotic trip. Also known with the name Kaapstad, as it is called by Afrikaans, this city is a great destination for those who want to witness a unique way of culture in a truly breath taking geography. Cape Town is the second most populated city in the country, with an estimated number of 3.75 million people, after Johannesburg. It is the legislative capital of the country and this surely plays a major role in its raising popularity. What makes Cape Town this distinctive is probably the richness of the geographical diversity the city has. In addition, its location that is near to the Cape of Good Hope and Table Mountain turns the city’s setting into a dream-like one. From December to February, Cape Town has got the best weather for you to enjoy the city. You should actually have your sun block with you all the time if you don’t want to have nasty sunburns. From June to August is the time for winter in Cape Town and this usually means a lot of rain. Don’t forget, the temperature may go down to -2 to -5 during winter at night. Another name for Cape Town is the Mother City and to be honest, this city surely deserves to be called so as it is the main center for all sorts of cultural, sports and art events as well as being a hub for international meetings and the heart of business in South Africa. Cape Town stands as the best introduction to the South African way of life. This city makes it possible for travelers to experience a different sort of metropolitan that has the most colorful texture of nature as its setting. The time spent in Cape Town is surely going to be among the best times of your life that you will remember with longing. Cape Town is located Table Bay, on the southern tip of South Africa. How to get to Cape Town? Located 20 km from the city center, Cape Town International Airport gives information about how to reach the airport from the center or to the center from the airport. How to get around in Cape Town? Cape Town is not a suitable city to discover on foot as it is usually divided by motorways. Golden Arrow and My Citi are the two bus operators in Cape Town and both of them have routes that cover major parts of the city. Renting a car is another option however as driving is on the left in South Africa, it may be a bit tricky. You may find car rental services in the airport. Metered Taxi is another way of getting around in the city. The prices are usually fixed and the drivers known to be reliable however it is advised you ask for a company from your hotel. When it comes to what to do in Cape Town, well, the options are literally limitless. It is all up to what sort of entertainment you want to have. Bo-Kaap Museum, District Six Museum, South African Maritime Museum and South African National Gallery are some of the most predominant museums in the city and all of them guarantee a different sort of experience for museum lovers. Bo-Kaap and The Castle of Good Hope are two main areas you should spare some time to see while in Cape Town. You can spend a lovely afternoon at Kirstenbosch Botanical Gardens smelling the beautiful flowers that you didn’t know about their existence. Rhodes Memorial and Cape Town City Hall are two main sightseeing areas in the city. In addition, Robben Island, where Nelson Mandela and a lot of other political figures were kept prisoners, is another point of interest in Cape Town. If what you are looking for is African handmade art or any sort of hand crafted item, then Green Market Square is the place where you should go. You can find almost anything that is genuinely South African. Don’t forget, bargaining is perfectly welcomed in the area. Victoria & Alfred Waterfront area is the place where most of the shopping in the city is done. You can find stores that you have already know as well as some African brands there. In addition, there are shopping malls in the area too. Cavendish Square and Tygervalley are the other two main destinations in Cape Town that are visited by travelers who are looking for more shopping. The travelers of Cape Town are surprised by the number of restaurants in the city. Most of these serve really good food, and what is even better, they are far away from being expensive. If you would like to find a nice restaurant to dine, V&A Waterfront, Long Street, De Waterkant and Green Point has a bunch of them. In addition to classic South African food, most of them also serve international cuisines. Camps Bay is the hip area of the city and you can come across to the shiny cars, super restaurants and chic people all the time. I am not even mentioning the exquisite restaurants. If you would like to have a drink or two after your dinner, then you can find just the right place on Long Street. If you want a bit more fun, some music and dance, then Camps Bay or Cape Quarter is the place you should head to. Climbing, surfing, kite-surfing and seal snorkeling are among the famous excursions you can participate in Cape Town or nearby areas. If you are after a bit more adrenaline, then deep sea fishing and shark cage diving are also among your options. Whale watching is another once in a life time experience you can get in Cape Town. If you would like to do safari or join in similar tours, then maybe you should keep in mind that they all need a couple of days to spend. Of course there are one day trips but if you want to make the best out of it, then sleeping over at the place you went to do the safari is advised. If you want to keep it a bit calmer, then you can join in a wine tour, as you are one of the rightest place for that. Well, for some of the people Cape Town has become more famous with being the home for FIFA World Cup 2010 in event tourism scene, however that sort of an event was the fruit of long and dedicated work. Cape Town has long been an important city in the field and host many international congresses, conferences, symposiums, exhibitions, fairs and tradeshows every year. The venues and centers in the city, the quality of the hotels and the natural treasures of the city turn Cape Town into one of the best cities to host these sort of events.